Group Visits at Princes Theatre01255 686633work Group VisitsThe Princes Theatre, situated inside the listed Clacton Town Hall, in the popular and picturesque resort of Clacton on Sea presents a wide range of live entertainment on stage throughout the year. With a mobilised tiered seating system by audience systems it allows the 820 seat 1930's theatre turn into a multi purpose venue, with a seating capacity of 300 guests for an array of events, including; functions, exhibitions, award evenings, product launches, training courses, charity events, birthday parties and wedding receptions. The theatre team will be able to assist with and give a full range of support services for all events, including your very own wedding co-ordinator for wedding receptions! 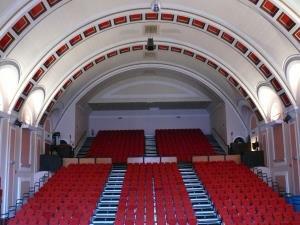 Owned and administrated by Tendring District Council the theatre is currently looking into a wedding license. Which could mean the happy couple could tie the knot and get married live on stage! If the Princes Theatre receives the go ahead for the wedding licence, this will then turn the theatre into a unique wedding venue, attracting people from across the country. From traditional and sophisticated to dramatic and theatrical, the Princes Theatre can suit every style, with a team that can guarantee the bride and groom the dedicated attention every wedding deserves. Aiming to be accessible and welcoming to all, we are committed to making every visit as easy and enjoyable as possible. The Theatre is accessible by wheelchair and also benefits from an induction loop in the auditorium and Bar area. Separate to the main auditorium, there is a fully licensed bar, called the Essex Hall. The Essex Hall can also be converted into another Meeting/ Conference room, with a capacity of up to 60. The Princes Theatre, situated inside the listed Clacton Town Hall, in the popular and picturesque resort of Clacton on Sea presents a wide range of live entertainment on stage throughout the year. The experienced technical team, along with the new management team are working hard to make the Princes Theatre one of the top multi purpose venues in the district. Ticket prices vary for each, concession & group rates are available on certain shows.